Dr. Bronner's Bar Soaps are made from high quality, mostly certified organic ingredients. Included in Dr. Bronner's Bar Soaps are Hemp Oil,Coconut Oil, Jojoba Oil and more. All Dr. Bronner's Bar soaps are Oregon Tilth certified. 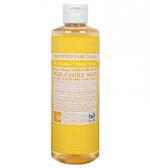 Dr. Bronner's liquid castile soaps are very concentrated, and lend themselves to a large variety of household uses from cleaning to washing. 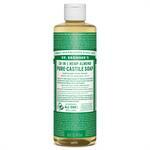 Dr. Bronner's Liquid Castile Soaps come in 4 ounce, 8 ounce, and 16 ounce bottles for your convenience. Dr Bronner's Eucalyptus Soap, liquid 4 fl. Oz. Dr Bronner's Lavender Soap, liquid 4 fl. Oz. Dr Bronner's Mild Baby Formula, liquid 4 fl.Oz. Dr Bronner's Peppermint Soap, liquid 4 fl. Oz. Dr Bronner's Tea Tree oil Soap, liquid 4 fl. Oz. The Tea tree oil, found in Dr. Bronner's liquid castile soap, is a natural antiseptic that helps heal cuts and bruises, as well as skin conditions like acne, dermatitis, and psoriasis. 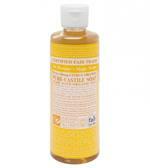 Dr. Bronner's Almond Castile Soap, 16 fl. oz. Dr. Bronner's Eucalyptus Castile Soap, 16 fl. oz. The organic orange, lemon and lime oils in Dr. Bronner's Citrus Orange Castile Liquid Soap stimulate the skin and invigorate the body, resulting in a truly refreshing shower experience. Dr. Bronner's Peppermint Castile Soap, 16 fl. oz.